Foot injuries can sometimes get complicated during the healing process. It is imperative that the wrap is not too tight as it may cut off circulation and that it is not too loose as it may come off. If your pet has any tendency to go after the dressing around the paw, a e-collar or comfy cone may be beneficial to prevent the pet from ripping off the dressing and destroying the repair that was done. Secondly, the dressing and the paw must remain clean and dry. If the dressing gets wet, the wound that has not healed, along with any part of the body covered in wet wrap can easily become infected, flaky, and actually reverse the healing mechanism of the body. One way to take care of this issue while the pet is in the house is to find an old sock ,pull it up over the wound, use some tape so that the sock will not fall down, wrap it, and fold the sock over the tape. Obviously, that sock must remain dry. 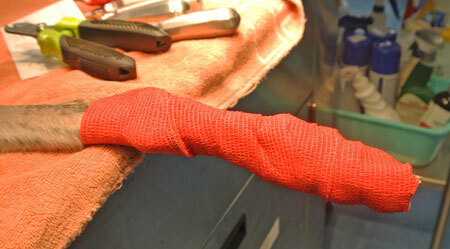 If your pet is coming from a veterinary clinic, ask them if they have an old intravenous plastic bag. If the pet goes out in inclement weather, the bag can be slid over the dressing area and tape can be used to keep it in place. 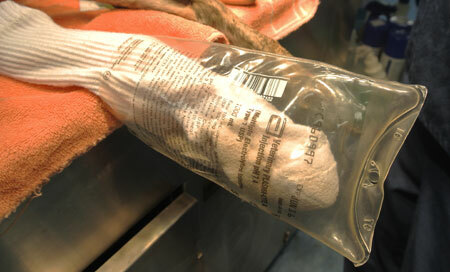 The bag should be removed as soon as the pet returns and an inspection should be made to make sure the dressing is dry. 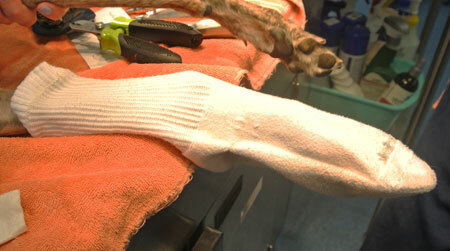 If the dressing gets wet, it is important to either return to the vet to have it rewrapped immediately or take the dressing off, cover it with a sock, and then return to your vet for redressing.